Alert Shirt from Foxtel, Wearable Experiments uses haptic feedback to let fans feel the hits. Be the envy of the bros. If you’ve ever wanted to feel what it’s like to take a massive hit during a game of football, then the cable television provider Foxtel, creative agency CHE Proximity, and wearable technology company, Wearable Experiments (We:eX), have the shirt for you. Yes, Americans, it’s Australian Rules Football. But the game is still intense. 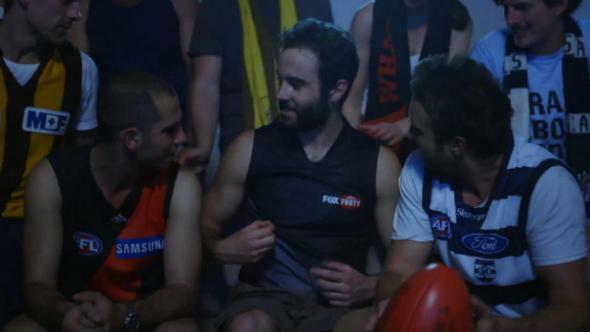 And footy—not to be confused with soccer—has avid Australian fans, who Foxtel seems to think would be keen to get inside the jerseys of their favorite players. The “Alert Shirt,” apparently the first of its kind, is designed so that fans can feel like they’re part of the game. Wearers of the shirt, the ad tells us, will feel it all: From players colliding, to a spiking heart rate when the clock’s running down, to exhausted lungs after a long sprint. “Up until now fans have only been able to connect with their team on an emotional level. Now they can physically feel every impact, rush of adrenalin, or anxious heart beat,” Leon Wilson, CHE Proximity executive creative director, said. The glossy promotional spots are not entirely forthcoming about how the “Alert Shirt” will work. We:eX says the project merges “hardware, software and apparel design” which means … something. Live game data will be sent via a Bluetooth mobile app to “haptic feedback motors” in the shirt. (Haptic technology is what’s used in gaming consuls to make them vibrate.) The shirt then vibrates to approximate the physical rigors of the player, and the intensity can be increased or decreased by the wearer. AdNews suggests that the shirt uses the same “picovibes” vibrating technology that was used for Durex’s Fundawear, which We:eX was also involved with. The condom brand’s Fundawear, basically vibrating underwear connected to a mobile app that acts as a remote, is still not widely available to long-distance lovers everywhere. But brands seem to think that Aussies are especially into apparel that pulsates—brave Australians can still nominate themselves to be part of Durex’s testing phase. The “Alert Shirt” is exclusively available to Australian Football League club members who purchase Foxtel or Foxtel subscribers. The price of the shirt is still unclear, but Brent Costelloe, an Australian sports journalist, told his Twitter followers that only 3,500 will be distributed across Australia. And so far, it seems that it’s not a prank—the app is already listed on the iTunes store and Google Play. How well the shirts actually work remains to be seen. Until then, it’s a canny publicity stunt for a cable sports provider just before the 2014 season of AFL begins. Despite being unsure why you’d want to feel what it’s like to be tackled in midair, I’m unwilling to dismiss the entire thing. American readers may not know what I’m talking about, but anything that potentially puts me inside the shirt of Hawthorn Captain Luke Hodge is a good thing.